What’s the buzz? 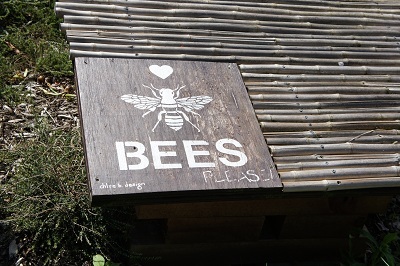 Bees are important. My bee walks started in April, 2012, and have become a regular event. 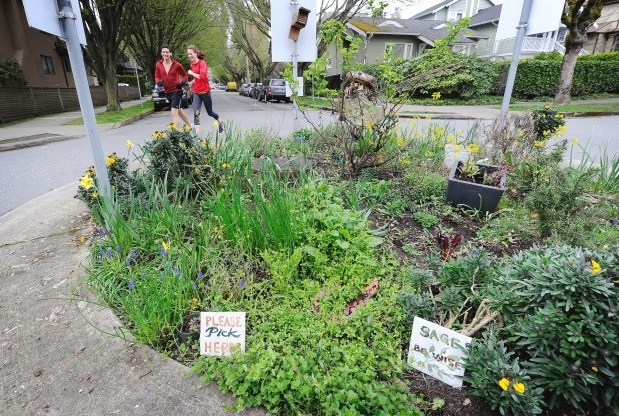 We take about 2 hours in a relaxed pace, stopping to talk about bees and the neighbourhood as we go. See photos and some links below – and follow the bee blog for other information and ideas. Follow the Bee! 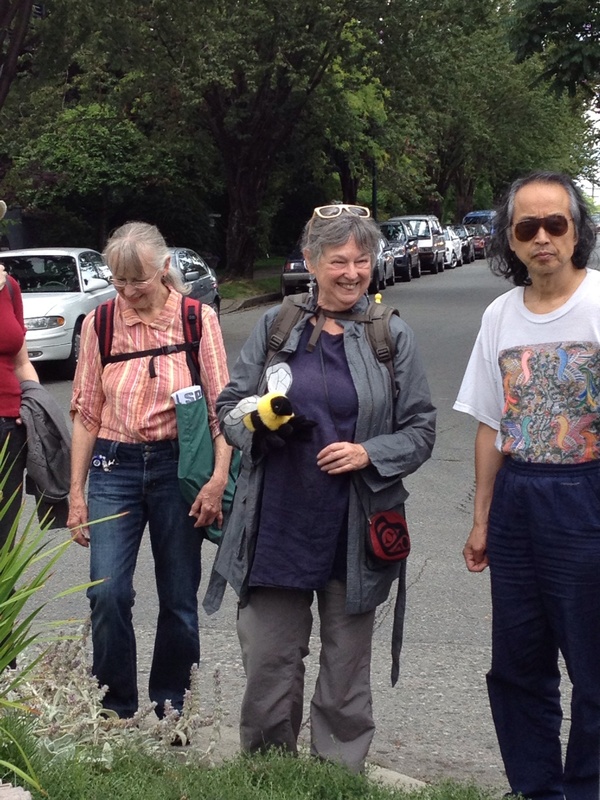 Bee walks have gone ahead with 30 plus people and once in torrential rainpour – 1! This is the bee gate (note the honeycomb pattern) and bee hives at the Cypress community garden. Walk along the railway tracks east of City Farmer and look north for bright blue hives. Thanks, Liz, Malachi and Charlotte! 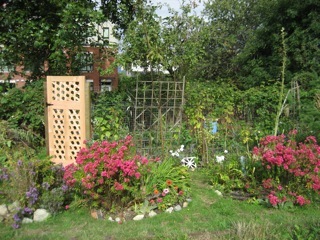 Chloe’s mason bee castle or “insect hotel” was first of all at the roundabout garden at 6th & Yew and is now in a very special place of honour at City Farmer – just back of the honey bees. 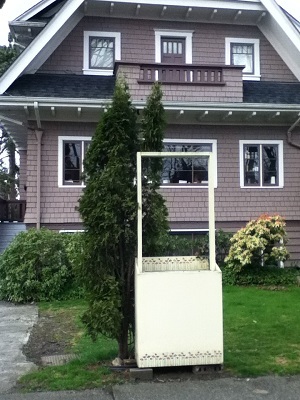 Markus Storhas puts out honey on an honour system at a stand on 6th near Vine. 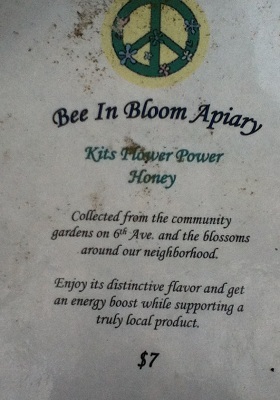 Here’s Markus’ stand Bee in Bloom in the off season. 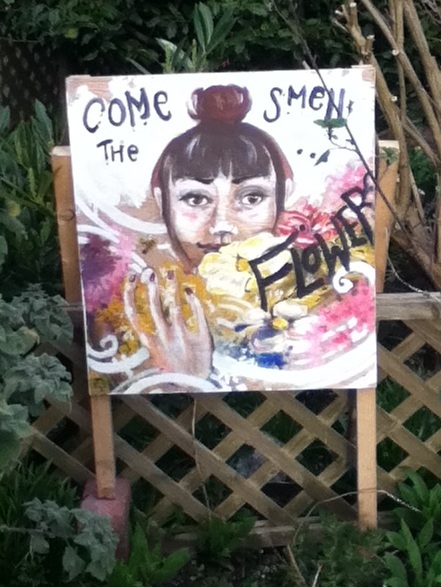 Later there’ll be jars of honey and a Bee in Bloom sign. 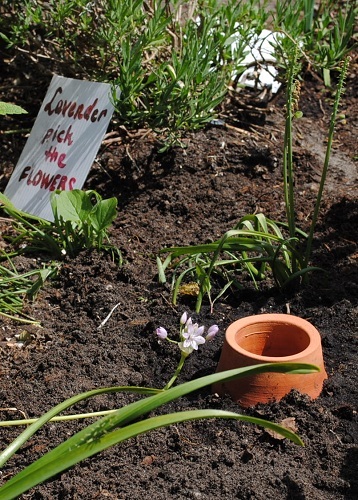 My corner – half way between my roundabout herb garden and the Wired Monk, my “third place”. Cohen and Noella holding a mason bee. 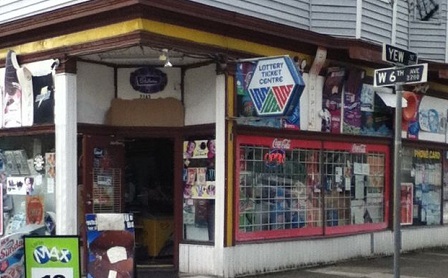 Corner store at 6th & Yew – this corner famous for Chloe Bennett installing a “mason bee castle” – It’s now moved to a very, very special spot at City Farmer and has been renamed as an “insect hotel”. 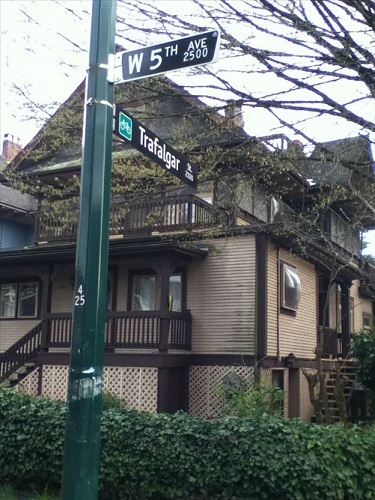 The blue building is where City Farmer is located – just go around the side to the Maple Street entrance to find lots of good stuff. 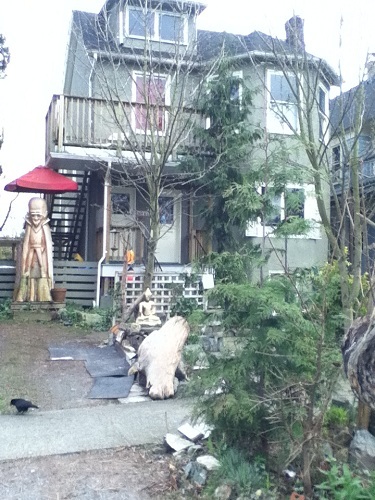 Along fifth is what some call “the last of hippie Kitsilano”. 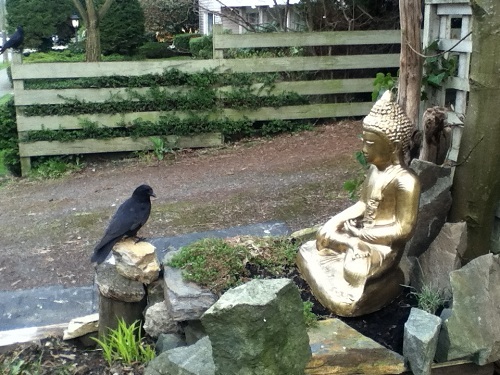 The crow is meditating. Good place to stop for ice cream while on a bee walk. 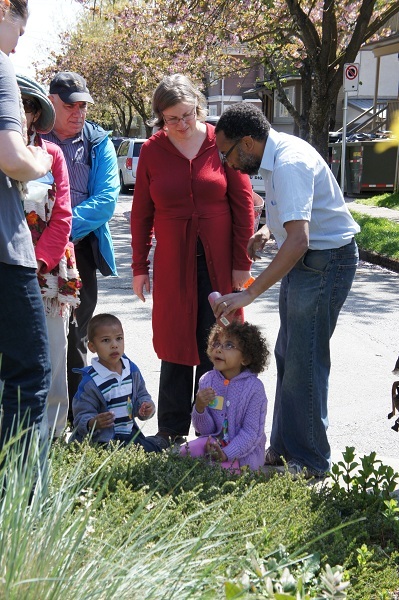 May 4, 2013 was the 7th bee-line walk. 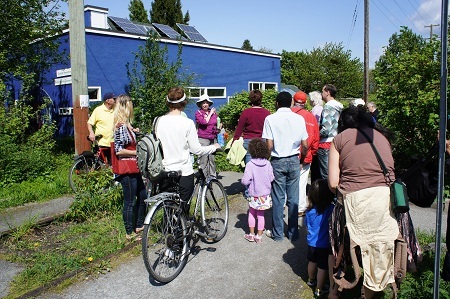 Over 30 people attended and we wound up at Linden Tree Place and treated to a visit to the rooftop garden by the Gardening Committee members. Mary’s First Bee Walk – video.